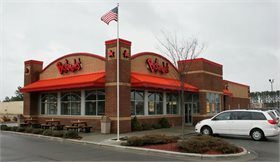 Ahoskie, NC Bojangles'® Tands, INC. Store #33 - Bojangles'® / Tands, Inc.
Ahoskie, NC loves the bold flavors and filling southern-style food at Bojangles’®! As the retail hub of Bertie and Hertford Counties, Ahoskie is the perfect spot to stop in for some quick shopping and a fast, delicious meal at Bojangles’®. Swing by the Ahoskie Bojangles’® to spend some time with family or friends eating food everyone will love. The Bojangles’® menu includes many old favorites like our famous fried chicken and Homemade biscuits. But Bojangles’® offers Ahoskie so much more! Orders some sweets, like the popular Bo-Berry Biscuit®, or get a healthy option with a Bojangles’® salad. For breakfast, lunch, or dinner, Bojangles’® in Ahoskie, NC has just the food to fit your cravings.